A SUPREME PROMOTION HAS ARRIVED! RUB THE GENIE'S LAMP TO BOOST SALES IN YOUR VENUE TODAY! HIT THE JACKPOT WITH GENIE! THIS IS NO MONKEY BUSINESS - OUR SUPREMELY DESIGNED 'GENIE'S JACKPOT' WILL RAISE THE ROOF IN YOUR VENUE..
YOU WILL HAVE AN EDGE OVER YOUR COMPETITORS WITH THIS AWESOME GAME SHOW FORMULA YOU ARE SET FOR MORE SALES & A INCREASE IN RETURN PATRONAGE. THIS IS THE WINNING CHOICE OF GAME SHOW PROMOTIONS THAT WILL EXCITE YOUR PATRONS. GENIE IS ON THEIR SIDE TO TAKE HOME THE JACKPOT BUT THOSE CHEEKY MONKEYS ARE SWINGING AROUND TO STOP THEM IN THEIR WINNING STREAK PATH. REGARDLESS THIS WILL NOT ONLY ENTERTAIN YOUR GAMING MACHINE PLAYERS YOU CAN ALSO PLAY THIS GAME IN YOUR LOUNGE AREA. GENIE GUARANTEE'S SUCCESS IN YOUR VENUE WITH OUR CRITICALLY DESIGNED FORMULA SET TO BE THE BEST OF BOTH WORLDS FOR YOU & YOUR PATRONS! 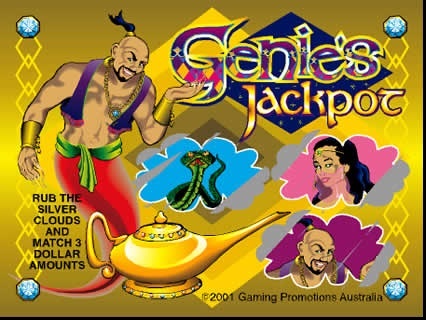 RUB THE GENIE'S LAMP & YOUR PATRONS CAN WIN INSTANT PRIZES OR GO IN THE DRAW TO PLAY THE AWESOME GENIE'S JACKPOT GAME SHOW.. SCRATCH CARDS ARE A SURE FIRE WAY TO BOOST YOUR BOTTOM LINE!